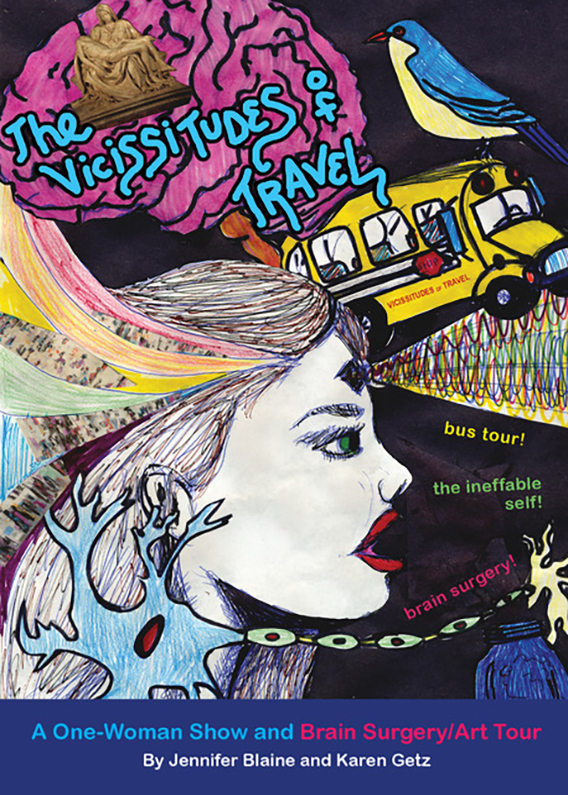 The Vicissitudes of Travel is a one-woman, gently-immersive theatrical bus ride through brain surgery and family history. Panicked and desperate to save the brother she knows and loves, “Sister” charters a guided bus tour through his brain surgery, hoping to capture and save his “essence” should things go awry. Along the way we encounter the people, experiences, biology and ephemera (all played by Blaine) that define his identity and the ineffable bonds of love which transcend them all. Jennifer Blaine (co-creator, writer, solo performer) has been performing one-woman shows for 24 years. Her original writing, performing, and comedy delve into serious and socially relevant issues and provides audiences the opportunity to unite in laughter. Jennifer has opened for George Carlin, performed with Chris Rock, and Joe Piscopo. She was featured on ABC’s Philly After Midnight: Women Comedians. According to the Philadelphia Daily News “not even Sybil can compete with Blaine’s cast of characters. Her comic genius is like Lily Tomlin and Tracey Ullman.” She is the founder of "5,000 Women," which features artists and social activists whose works inspire change in the world. Her solo work has appeared in 16 FringeArts festivals (including pick of the Fringe), PIFA at The Kimmel Center, The Annenberg Center for the Arts, the Samuel Beckett Theatre on Theatre Row, many colleges and universities, cabarets and theatre festivals throughout the U.S.